Iter Britanniarum, displayed as a road map. The plotted routes and stations are approximations. The Antonine Wall and Hadrian's Wall are shown. The Antonine Itinerary (Latin: Itinerarium Antonini Augusti, lit. "The Itinerary of the Emperor Antoninus") is a famous itinerarium, a register of the stations and distances along various roads. Seemingly based on official documents, possibly from a survey carried out under Augustus, it describes the roads of the Roman Empire. Owing to the scarcity of other extant records of this type, it is a valuable historical record. Almost nothing is known of its date or author. Scholars consider it likely that the original edition was prepared at the beginning of the 3rd century. Although it is traditionally ascribed to the patronage of the 2nd-century Antoninus Pius, the oldest extant copy has been assigned to the time of Diocletian and the most likely imperial patron—if the work had one—would have been Caracalla. The British section is known as the Iter Britanniarum, and can be described as the 'road map' of Roman Britain. There are 15 such itineraries in the document applying to different geographic areas. The itinerary measures distances in Roman miles, where 1,000 Roman paces equals one Roman mile. A Roman pace was two steps, left plus right. Roman paces were not everywhere the same, and conversion to modern units is imprecise, but 1 Roman mile approximately equals 1,430 metres (0.89 mi). Below are the original Latin ablative forms for sites along route 13, followed by a translation with a possible (but not necessarily authoritative) name for the modern sites. A transcriber omitted an entry, so that the total number of paces does not equal the sum of paces between locations. Below are the original Latin names for sites along route 14, followed by a translation with a possible (but not necessarily authoritative) name for the modern sites. De Situ Britanniae (made available c. 1749, published 1757) was a forgery that provided much spurious information on Roman Britain, including "itineraries" that overlapped the legitimate Antonine Itineraries, sometimes with contradicting information. Its authenticity was not seriously challenged until 1845, and it was still cited as an authoritative source until the late nineteenth century. By then, its false data had infected almost every account of ancient British history, and been adopted into the Ordnance Survey maps, as General Roy and his successors believed it to be a legitimate source of information, on a par with the Antonine Itineraries. While the document is no longer cited, since its authenticity became indefensible, its data has not been systematically removed from past and present works. Some authors, such as Thomas Reynolds, without challenging the authenticity of the forgery, took care to note its discrepancies and challenge the quality of its information. This was not always so, even after the forgery was debunked. Gonzalo Arias (died 2008) proposed that some of the distance anomalies in the British section of the Antonine Itinerary resulted from the loss of Latin grammatical endings, as these had marked junctions heading towards places, as distinct from the places themselves. However, Arias may not have taken account of earlier work indicating that distances were measured between the edges of administrative areas of named settlements as opposed to centre-to-centre, thereby explaining supposed distance shortfalls and providing additional useful data on the approximate sizes of such areas. Chisholm, Hugh, ed. (1911). "Antonini Itinerarium" . Encyclopædia Britannica. 2 (11th ed.). Cambridge University Press. p. 148. ^ Rivet, A. L. F.; Jackson, Kenneth (1970). "The British Section of the Antonine Itinerary". Britannia. 1: 34. doi:10.2307/525833. 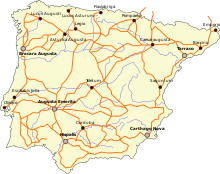 ^ For most Roman roads in Hispania, see Gonzalo Arias. "El Miliario Extravagante". Archived from the original on 2011-07-25. Retrieved 2012-08-27. . Cf. also his Grammar in the Antonine Itinerary: A Challenge to British Archaeologists (available in only a few libraries). ^ Cf. Rodwell, "Milestones, Civic Territories and the Antonine Itinerary", 6 Britannia 76-101 (1975). The standard modern edition of the Itinerary is in O. Cuntz, Itineraria Romana, vol. 1: Itineraria Antonini Augusti et Burdigalense (Leipzig 1929), nos, 1 – 75 (terrestrial), 76 – 85 (maritime).